As children approach preschool age, they begin to get a little more adventurous. That is why you will find more slides and slightly higher deck sizes in our selection of playground equipment for preschoolers. You will find that these play systems appeal to this age group because they feature a little bit of everything. 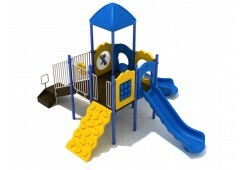 Our online selection has preschool playground equipment with themes that kids love. Kids are likely to continue their active lifestyle with the help of these great play systems. Consider a few of the many ways that preschool kids benefit from spending time on the playground. When kids use our preschool play systems, they are developing their gross motor skills. For instance, when kids climb the steps on a piece of preschool play equipment, they are strengthening muscles in their arms and legs. Also, preschool kids build their arm and leg muscles when they propel themselves down a slide or swing on a piece of commercial playground equipment. Jumping, hopping, skipping, and running are all healthy activities for kids playing on preschool playgrounds. Kids playing on preschool playgrounds can work off their excess energy while developing their sense of balance. A child develops a sense of balance as they walk up steps to reach the slide on one of our play systems. Also, kids improve their balance as they maneuver their bodies to go down a curved slide. On a playground, preschool kids have many opportunities to increase their skills of balance and coordination. Preschool kids learn many social skills on a playground. For instance, they learn how to take turns while using the various pieces of playground equipment. Also, preschool kids learn how to organize and play simple games with their peers. Learning how to successfully interact with peers is an important skill for preschool kids. 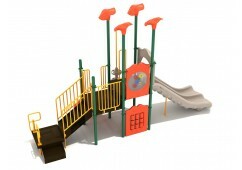 All of our equipment is safe and durable, and we carry many well-known brands of playground equipment. We also have several delivery options to our customers. 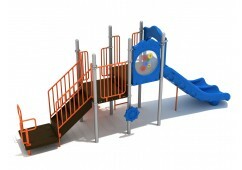 Contact us today to get a quote on any of the quality preschool playground equipment in our online selection!